Not since the advent of the television ad in 1941 has the potential for new ad formats been so great. The emergence of digital platforms is enabling marketers to experiment with a number of new ad formats, each of which could revolutionize marketing as we know it. Throughout 2014 we have been highlighting the most effective techniques being broadly adopted. 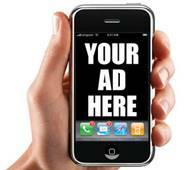 Here in Part VII of our series we address Mobile ads. Everyone these days has a mobile device. Or two. Or three. This rapid rise in adoption isn’t restricted to the developed world. While a sad commentary on the lack of sanitation infrastructure in less developed countries, a UN report indicating that more people globally own a mobile phone than have access to a flush toilet is an astonishing testament to mobile penetration. More vital than the fact that six out of every seven people in the world owns a mobile phone is that we take them nearly everywhere we go. 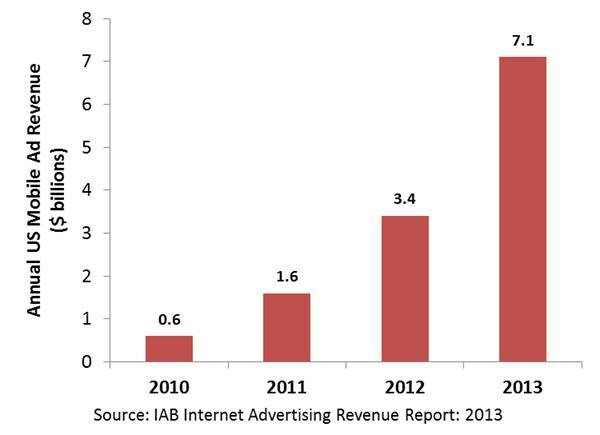 And in their 2014 mid-year report, the IAB indicated that in Q2 of 2014 mobile ad revenue constituted 24% of total internet ad revenue, confirming that mobile advertising has truly arrived! This tremendous growth in the use of micro ads on mobile devices has been accompanied by remarkable innovation in ad formats. There are numerous approaches to mobile advertising – static display, rich media, in-app, search, video, text messaging and branded apps. Innovative formats such as the IAB “Rising Stars” are being designed to increase user interaction. Add in the unique features of mobile devices (cameras, GPS, interactivity, vibration) that ads can leverage in creative ways and the potential for engaging users is tremendous. 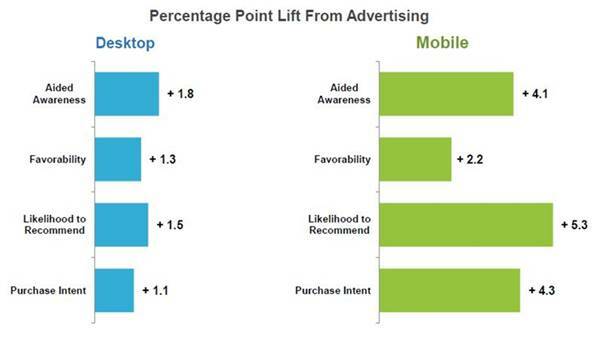 In fact, a comScore study showed mobile ads having substantially higher engagement levels when compared to ads served to desktop computers. But beyond format, the portable nature of mobile devices allows advertisers a unique opportunity to exploit a vital dimension in advertising effectiveness – the recency phenomenon. 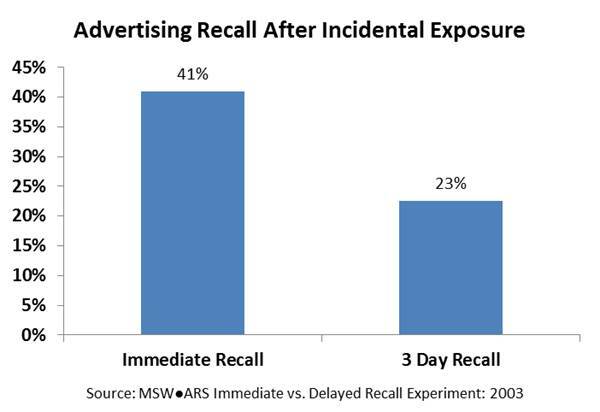 Recency research suggests that the closer in time advertising exposure is to an actual purchase occasion, the more likely the advertising will influence the buying decision. The impact of recency is well-proven in traditional media. Perhaps a study of Nielsen data by Colin McDonald illustrates this best. 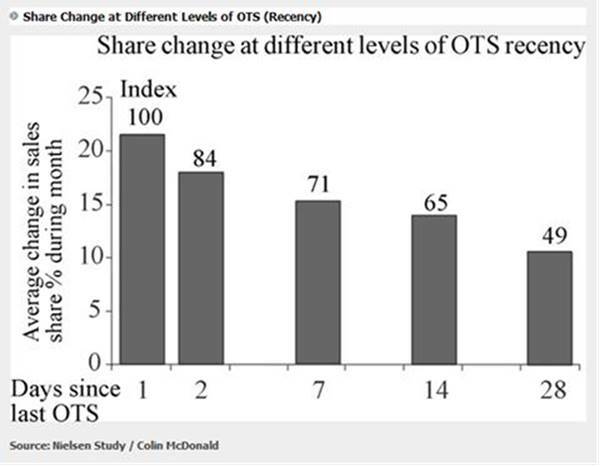 The impact of an ad on share change was shown to steadily decline as the time following ad exposure increased. This includes a drop of 16% from the first day following exposure to the second day. So what does this have to do with mobile? First, despite the fantastic and on-going growth in e-commerce, we still buy a lot of stuff the old fashioned way – at a physical store. But, mobile devices are often used as an aid in the process. In fact, comScore has reported that “nearly 3 out of every 4 mobile phone searches that end in a purchase bring customers into brick-and-mortar stores.” So with consumers using mobile devices as part of the shopping process, the potential exists for ad exposure in real time – recency taken to its extreme. Using location-targeting methods, advertisers can utilize either geo-fence targeting (creating a virtual area around a specific location such as a restaurant or retail store and serving ads to mobile device users who are detected entering the area) or geo-aware targeting (using the mobile device’s current location to serve ads relevant to the device owner’s proximity) to target temporally relevant advertising. 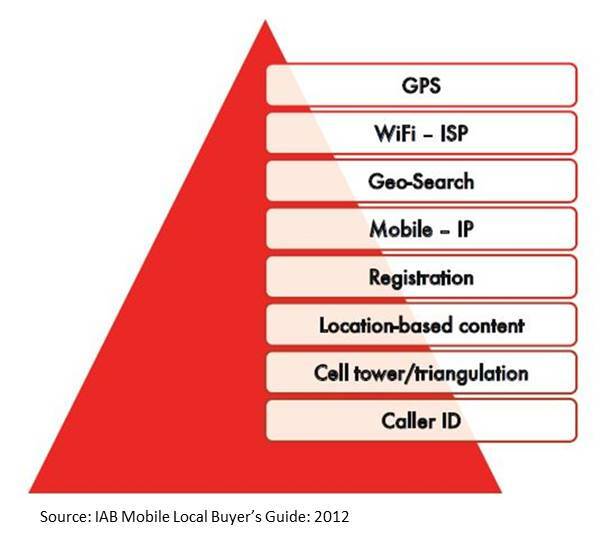 The IAB lists eight location targeting technologies by precision, with GPS being most precise, though use of multiple technologies is recommended due to inherent limitations with each (e.g., GPS works best with clear skyward sightlines). This campaign was designed to drive downloads of a ‘restaurant finder … it employed location-based technology and geo-targeted above-the-line messaging, to avoid sending potential customers to a locked door. Banner ads were served to smartphones on sites that the target audience of late-night travelers and shift workers were known to browse, when the recipient was in close proximity to an open restaurant…The app was downloaded 1.3m times over the course of the campaign, and when the sales uplift was calculated, the campaign delivered an ROI of 2:1. Another EMMA winner illustrates how global marketers can creatively take advantage of local targeting. Colgate used the occasion of Kumbh Mela, a Hindu pilgrimage in India billed as the largest gathering of humanity in the world (over 80 million visitors), to promote the new Ayurvedic toothpaste. A geo-fence was created around the festival’s Colgate promotional booth and pilgrims entering this radius were sent a message on their mobile phones encouraging them to visit the Colgate location. Due to low literacy rates, a voice message using a well-known radio personality was employed. 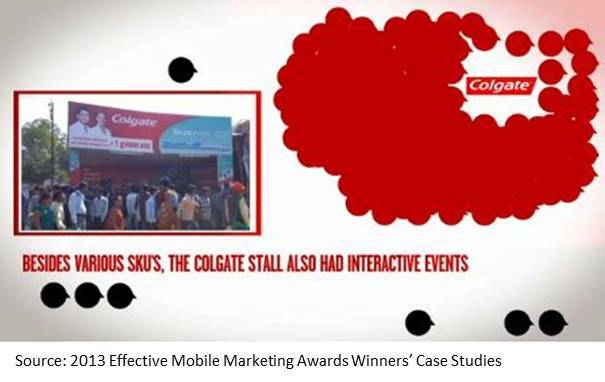 Visits to the Colgate booth increased over 300% compared to pre-promotion levels. Vincent Van Gogh once observed “Great things are done by a series of small things brought together”. When it comes to mobile advertising this observation definitely rings true. Please contact your MSW●ARS representative to learn about techniques for evaluating the performance of mobile advertising campaigns.